Finding a dress with sleeves is easier said than done. Which means . . . when you find a dress with sleeves that looks good on you, you really should buy it because who knows when you’ll find another. Material that stretches is the best for fabricating a dress with sleeves. Stretch allows the sleeve to fit closely without constricting. 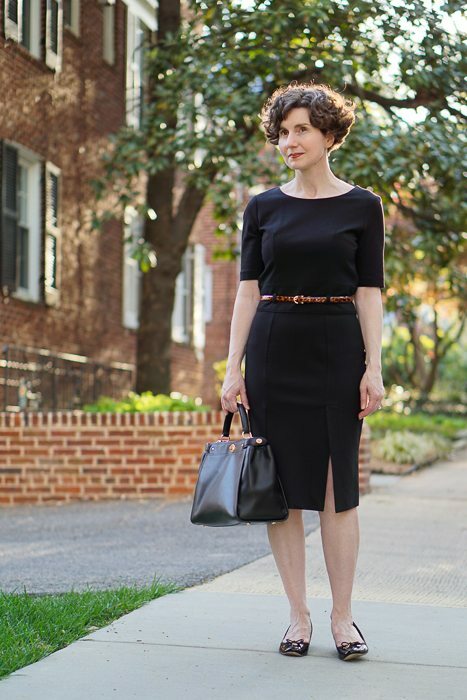 You may find this in certain wools (crepe and gabardine), but the most likely fabric is a ponte knit, like the dress I am wearing here. Let’s take one second to appreciate the off-center slit in the skirt of this dress. This design is so clever. It permits movement and the showing of a little leg, but provides coverage when you are sitting — which a center slit often does not. I found this dress on YOOX last year. It came with a self-belt that was attached to the dress and closed in the front with snaps. The snaps were gold-tone metal in the shape of stars. GoLD sTaRS? Gold stars look right in two places: on an elementary school test and on a military uniform. 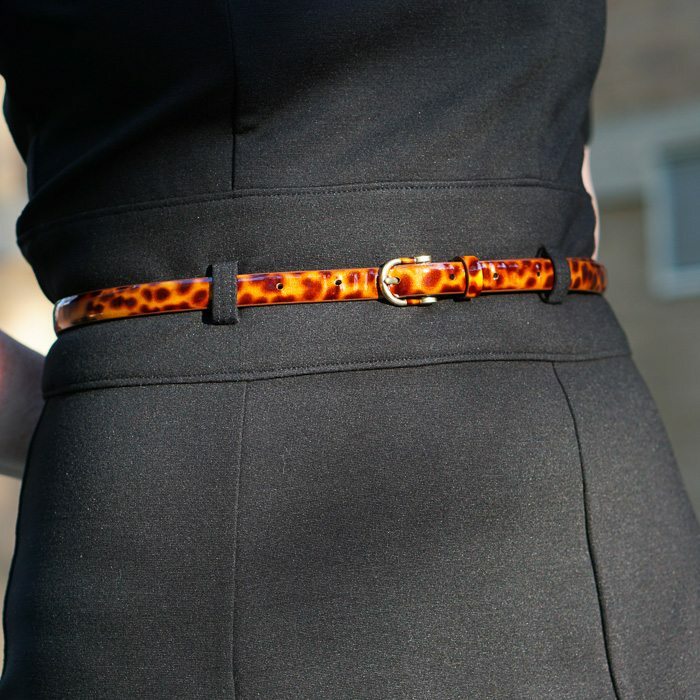 That belt (tHOsE sTaRS) had to go — and then I was free to replace it with any skinny belt of my choosing. 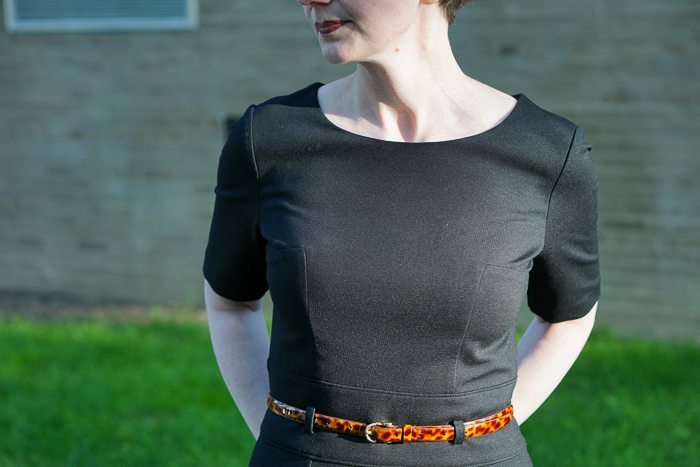 With this dress, a black patent or shiny calf leather would probably be the most obvious choice, but I decided to try this tortoiseshell print. 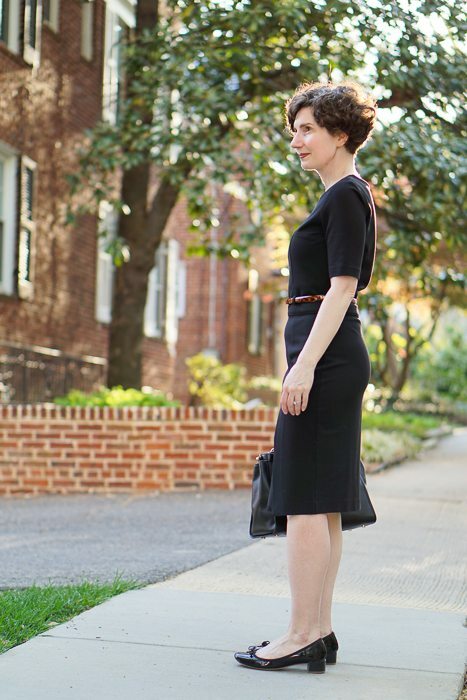 This dress is deceptively simple. At first glance, it’s a shift with a scoop neck and short sleeves. A closer look shows that the torso is shaped with vertical darts and horizontal seams which gives the dress a defined shape. This is a far better way to shape a dress than just curving the side seams in at the waist. 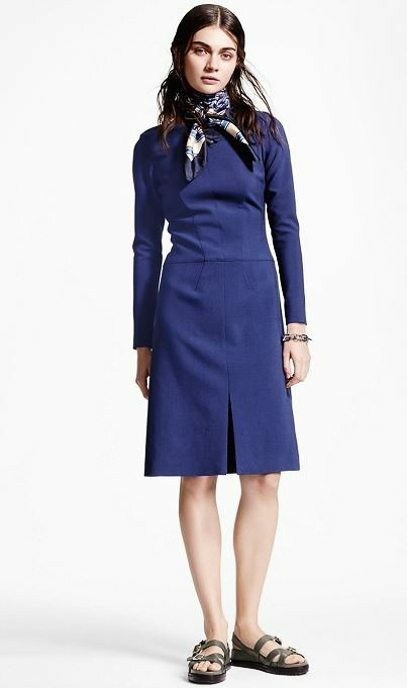 Brooks Brothers is having a sale — ends today (May 16) — that includes several dresses with sleeves. As we head toward summer, you may not have an opportunity to wear these now, but we are just four months away from the fall! I haven’t seen these dresses in person, but each appears to be made with well-placed darts and seams. Brooks Brothers Long Sleeve Wool-Blend Dress in Blue; are those Birkenstocks!? The holy grail! My kingdom for a dress with sleeves! Your post made me happy…. the dresses are modest, interesting and wearable! 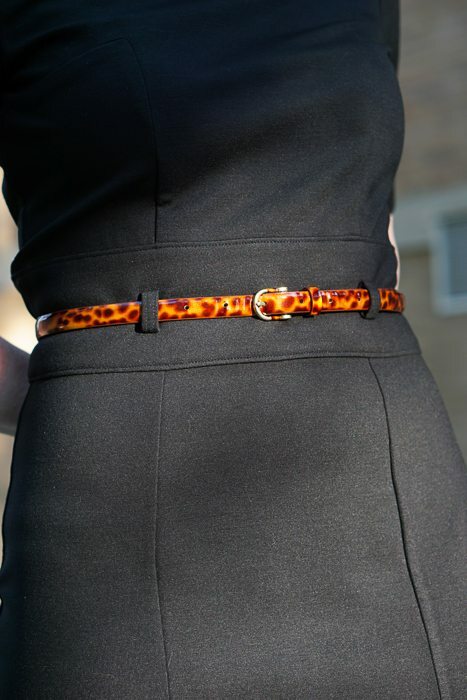 The dress is just right, and you chose the perfect belt to go with it. I bet your dear mother loves this! Very feminine. Lovely.